Redwood National Park is home to a tremendous collection of the world's tallest type of tree. For ratings, reviews, more things to do, and tourist information, go to the Redwood National Park trip itinerary maker tool . Des Moines to Redwood National Park is an approximately 11-hour flight. You can also drive. You'll gain 2 hours traveling from Des Moines to Redwood National Park due to the time zone difference. Traveling from Des Moines in July, expect nights in Redwood National Park to be a bit cooler, around 52°F, while days are colder, around 64°F. Finish your sightseeing early on the 14th (Sun) so you can travel to South Lake Tahoe. High in the Sierra Nevada mountains on the shore of one of America’s most scenic lakes, South Lake Tahoe captures the spirit of the outdoors and serves as a hub for tourism activities surrounding the lake. On the 14th (Sun), admire the majestic nature at D.L. Bliss State Park, contemplate the waterfront views at Cascade Falls Trail, and then tour the pleasant surroundings at Lakeside Beach. Get ready for a full day of sightseeing on the 15th (Mon): admire the majestic nature at Van Sickle Bi-State Park and then enjoy the sand and surf at Nevada Beach Campground. For maps, more things to do, photos, and other tourist information, go to the South Lake Tahoe journey builder website . Traveling by car from Redwood National Park to South Lake Tahoe takes 8.5 hours. Alternatively, you can fly. When traveling from Redwood National Park in July, plan for somewhat warmer days in South Lake Tahoe, with highs around 82°F, while nights are slightly colder with lows around 46°F. Finish your sightseeing early on the 16th (Tue) to allow enough time to travel to Yosemite National Park. Your day-by-day itinerary now includes Mirror Lake/Meadow Trail, Glacier Point and Cloud's Rest. You'll explore the less-touristy side of things at El Capitan and Nevada Falls Loop. Take a break from the city and head to Mariposa Grove of Giant Sequoias and Lembert Dome. 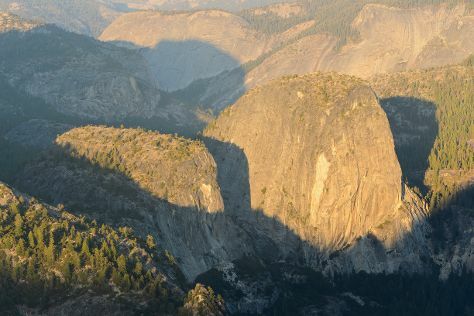 Next up on the itinerary: admire the sheer force of Yosemite Falls, get great views at Tunnel View, don't miss a visit to Olmsted Point, and hike along Lower Yosemite Fall Trail. To see maps, photos, traveler tips, and more tourist information, read our Yosemite National Park trip maker website . Traveling by combination of taxi and bus from South Lake Tahoe to Yosemite National Park takes 3.5 hours. In July, daily temperatures in Yosemite National Park can reach 83°F, while at night they dip to 46°F. Cap off your sightseeing on the 20th (Sat) early enough to travel to Zion National Park. Towering cliffs of red, white, and pink Navajo sandstone, stream-carved slot canyons, and big blue sky all characterize Zion National Park. Step off the beaten path and head to Temple of Sinawava Trail and Riverside Walk. Take a break from the city and head to The Narrows and Angel's Landing. Spend the 23rd (Tue) exploring nature at Zion National Park. For photos, reviews, where to stay, and tourist information, read Zion National Park trip itinerary maker . You can do a combination of taxi, bus, and flight from Yosemite National Park to Zion National Park in 11 hours. Another option is to do a combination of taxi, bus, flight, and car. You'll lose 1 hour traveling from Yosemite National Park to Zion National Park due to the time zone difference. Traveling from Yosemite National Park in July, things will get somewhat warmer in Zion National Park: highs are around 94°F and lows about 59°F. Finish up your sightseeing early on the 24th (Wed) so you can go by car to Page. Originally little more than a simple camp constructed to house workers who built a nearby dam on the Colorado River, Page is now a popular stop for travelers preparing a trip to Arizona's canyon country. 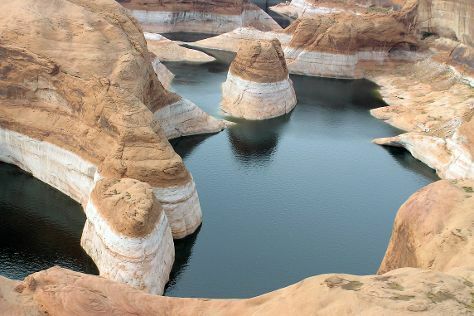 Start off your visit on the 24th (Wed): identify plant and animal life at Glen Canyon National Recreation Area. To find reviews, photos, ratings, and more tourist information, go to the Page trip planner . You can drive from Zion National Park to Page in 3.5 hours. Traveling from Zion National Park in July, you can expect nighttime temperatures to be a bit warmer in Page, with lows of 73°F. Cap off your sightseeing on the 24th (Wed) early enough to travel to Colorado Springs. National Landmark red cliffs and the even more striking Pikes Peak mountain attracts tourism to Colorado Springs. Take a break from the city and head to River Rafting & Tubing and Garden of the Gods. Step off the beaten path and head to Mueller State Park and The Winery at Holy Cross Abbey. Take a break from Colorado Springs with a short trip to Tunnel Drive in Canon City, about 1h 25 min away. There's still lots to do: tour the pleasant surroundings at Palmer Park, take in the awesome beauty at Cheyenne Mountain, and see the interesting displays at Rocky Mountain Dinosaur Resource Center. To find photos, reviews, more things to do, and tourist information, use the Colorado Springs travel planner. You can fly from Page to Colorado Springs in 6.5 hours. Alternatively, you can do a combination of car and flight; or drive. In July, Colorado Springs is little chillier than Page - with highs of 86°F and lows of 58°F. On the 28th (Sun), wrap the sightseeing up by early afternoon so you can travel back home.